Several Massage Mondays ago, I did a video on Cannabis/Marijuana Massage. 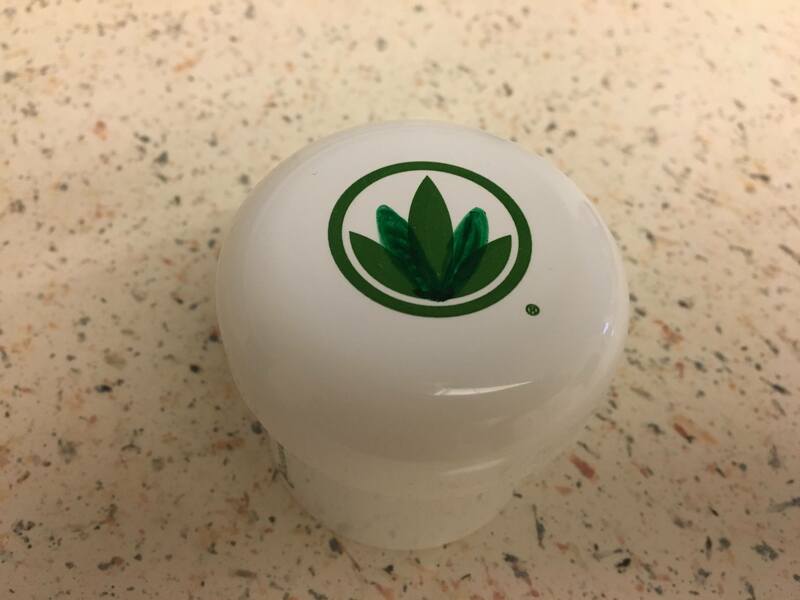 I talked about the difference between the cannabinoids CBD and THC and I mentioned that you may get high from the THC content of the massage lotion or oil because whatever you put on your skin gets absorbed through the skin. Since then I have been doing a crash course on the benefits and effects of cannabinoids and I’m finding out that this may not be the case. When it’s applied topically over the skin, these cannabinoids do not reach the bloodstream like they do when they are inhaled or ingested because our body has endocannabinoid system. It turns out our body already produces chemical compounds similar to cannabinoids found in the cannabis plants. We have receptors for these chemicals throughout our body including the skin. So when you apply the cannabis infused lotion or oil on your skin topically, these receptors on the skin lock them in and these cannabinoids do not reach the bloodstream. Anyway, you never know unless you try it. So I had my first cannabis massage. I asked one of my favorite massage therapists and she gladly helped me out. 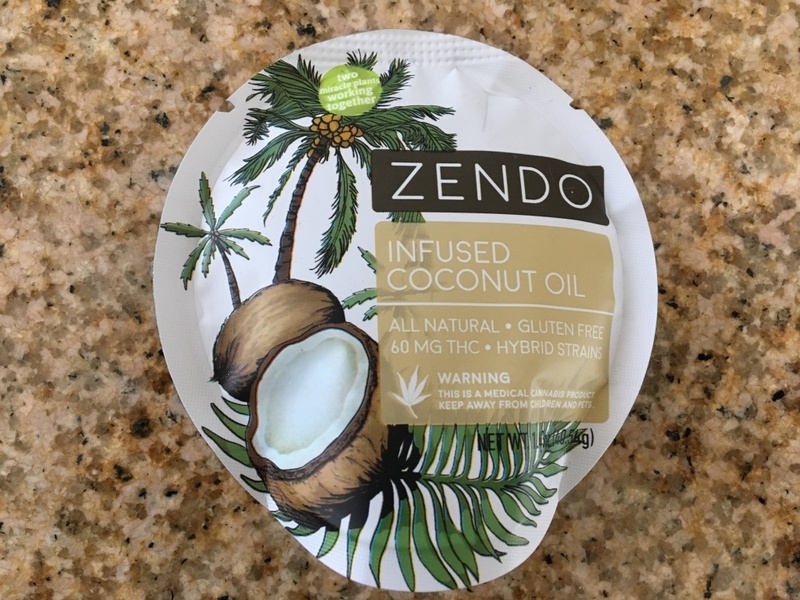 For this I chose this THC infused coconut oil by Zendo because I wanted to see if I get high from THC applied on the skin. Coconut oil is great for massage. Just like the regular coconut oil, this coconut oil is multi-purpose. It can be used for eating or applying on your skin. I found this at a local dispensary and it’s only 1.43oz with 60mg of THC and it was only $8. Perfect sample size. You can definitely smell the cannabis but it’s not too overwhelming. I needed a container for my special oil and found a perfect one lying around. 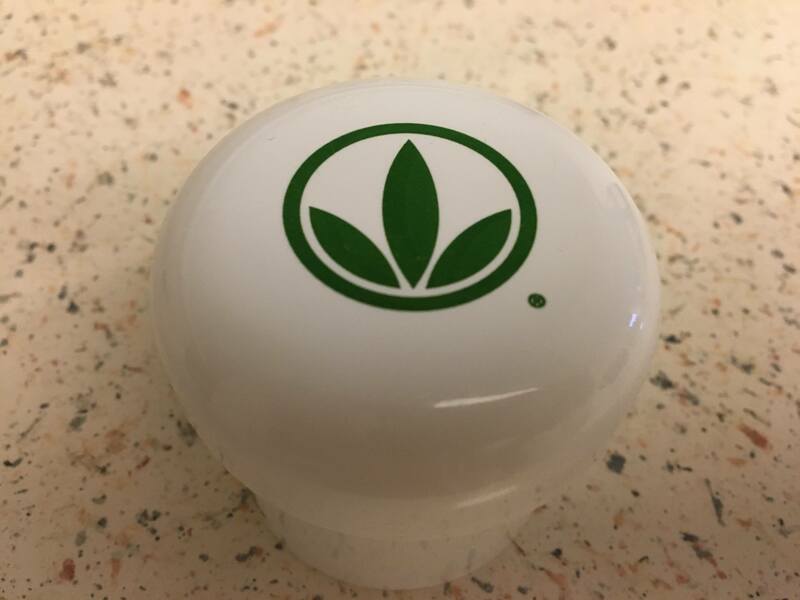 I used to do Herbalife long time ago. And I added few more leaves. I have had her massage several times so I know how good the massage feels. For the one hour massage she used about 2/3 of the container full so about 40mg of THC. Just like the coconut oil the oil melts in your hand right away and glides well and she didn’t need it that much but she knew I wanted to feel the effect so she used more than necessary and slathered it on my body. I love her. Here’s me after the massage. I just had my very first cannabis massage with coconut oil infused with THC and some CBD and I feel very relaxed. I’m very relaxed from her massage of course. I’ll see how I feel maybe in the next few hours as the massage oil gets absorbed in to my body and see if I have any difference in feeling. I will update later with my findings. It’s been 3 hours since I had my very first cannabis massage and I still feel very relaxed. After the massage I felt super relaxed and I drove home. It takes about 20 minutes to get home. I had no problem driving. After I got home I continued to feel very relaxed and so relaxing that almost lethargic and I didn’t feel like doing anything. So I just hit the bed and took a nap. I didn’t set the alarm or anything so after 2 hours of nap I just woke up. I also was feeling something in my throat so I thought sleeping would be a good way to just take care of myself. I still feel very relaxed. My head is clear. There is no high feeling. Just a muscle relaxation that I’m feeling. So far I’m loving this experience. So I did not get high from the cannabis massage with about 40mg of THC. I wasn’t cracking up or hallucinating and seeing things or craving munchies later. If I ingested that much THC I would be beyond high and very sick. At the dispensary, they were recommending 5-10mg for starters. While I didn’t have any psychoactive effects, the depth of relaxation was just something It’s something I’ve never experienced. I can say that there is definitely a synergy effect with massage and I am sold. I am willing to try different topical products and I’ll be more than happy to review them.